Have you ever imagined a hassle-free cooking experience especially when you want to give your baked and roasted food a final touch? Envision yourself creating the tastiest and most mouth-watering dishes on par with the best restaurants in the world! 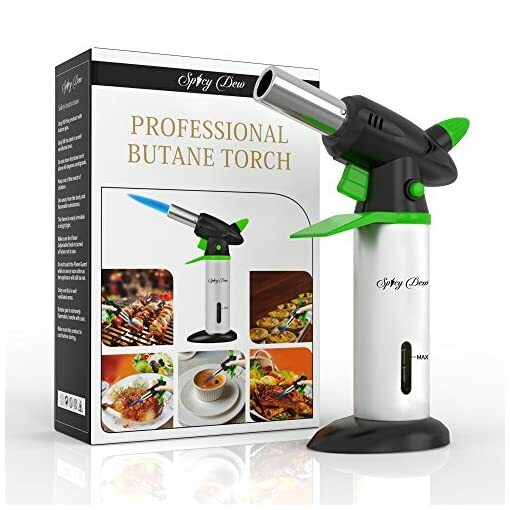 You are only a step closer by using our Professional Culinary Torch. 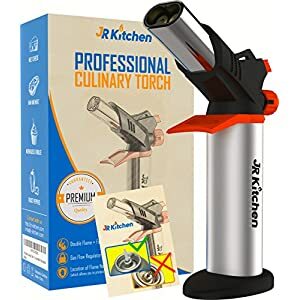 Built for reliability, safety and ease of use, this multi-purpose Culinary Torch brings the Professional chef’s experience to your kitchen, with a strong and consistent flame, our torch is your best tool! 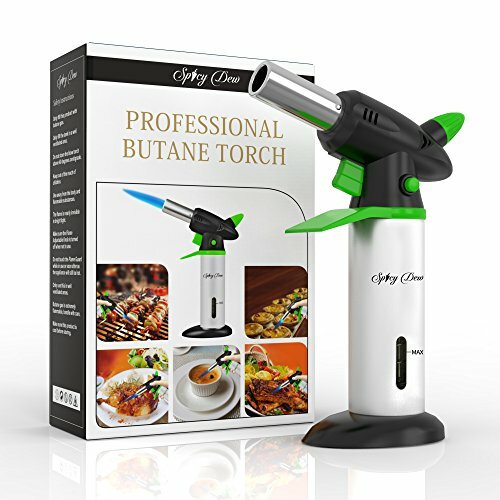 Why should you choose Spicy Dew Professional Torch? – To brown crème brulees, caramelize meringues, singe steaks, grill seafood, melt cheeses, toast breads, and make your BBQ parties even more interesting! – Our SUPERIOR QUALITY SAFETY PROTECTION kit guards you from the flame and allows for easy and precise maneuvering. – The ANTI-FLARE TECHNOLOGY and Child Safety Lock enables you to operate the product without a worry in the world! – It is as easy as A B,C to learn how to use it! To ignite the Torch, rotate the Flame Adjustable Knob counter clockwise. Press the Child Safety Lock and then press the Trigger, flame starts. The instant flame can burn to an amazing 2372 °F! To switch off the flame, press the Child Safety Lock, resetting its state and rotate the Flame Adjustable Knob clockwise to the end. – Made to LAST with a durable heavy duty metal body. – Depending on the size of the flame, the torch can burn up to 60 minutes. All of this with our 100% NO Questions, NO Hassle Money Back/Replacement Guarantee for 90 Days and a 3-year Warranty! 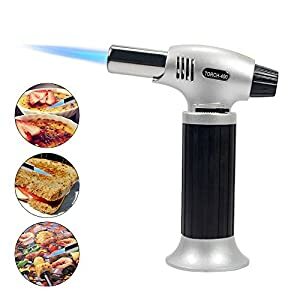 Sharpen your cooking skills with this master torch. With love from our kitchen to yours. Enjoy! 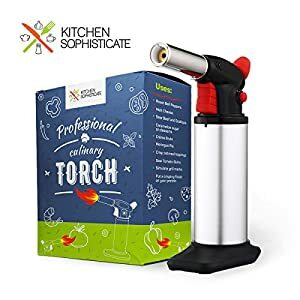 So ORDER NOW to have the torch ready for your kitchen next time. ✭✭✭✭✭ 100% RISK-FREE AND NO HASSLE WARRANTY – Spicy Dew is committed to provide the best quality kitchen products in the market and customer’s satisfaction is our #1 priority. We trust and stand by our distinctive torch. This is why our handheld blowtorch is covered with NO Questions, NO Hassle Money Back Guarantee for 90 Days and a 3-year Warranty! So, order now and consider getting our ever popular and safest torch for your best friend too. 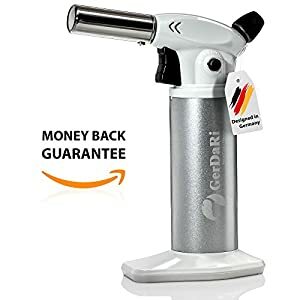 ✭✭✭✭✭ PROFESSIONAL AND HIGHEST QUALITY COOKING TORCH- Envision yourself creating the tastiest and most mouth-watering dishes on par with the best restaurants in the world! 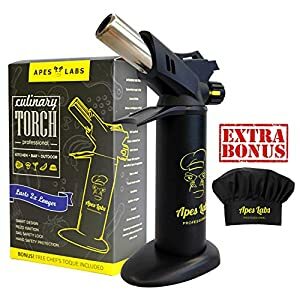 Used by top chefs, Spicy Dew torch is perfect for caramelizing sugar atop crème brulee, searing a steak, roasting bell peppers & marshmallows, melting cheese and toasting bread crumbs etc. Our amazing torch will let you transform simple recipes into dishes that look and taste as if they came from a professional chef’s kitchen. 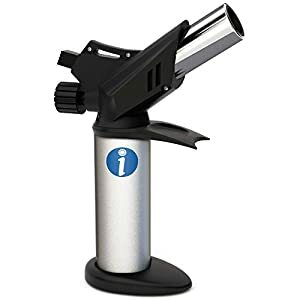 ✭✭✭✭✭ MULTIPURPOSE TOOL FOR INDOOR OR OUTDOOR USE- With its stylish and portable design, this torch is ideal for lighting candles, barbecue and fireplace . 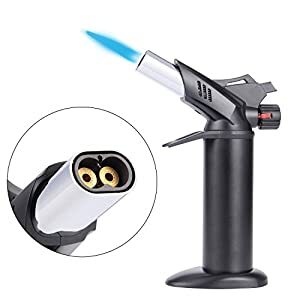 Thanks to its high burning temperature and extreme durability, our torch can be used for dabbing, soldering, welding, jewelry making, plumbing, camping and various art & craft applications. The instant flame can burn to an amazing 2372°F for up to 60 minutes. Comes in a top-quality gift box, Spicy Dew torch can be your perfect gifting idea. 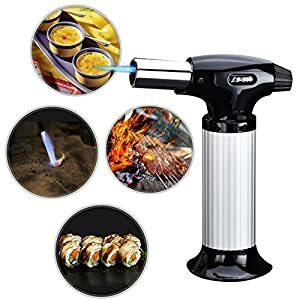 ✭✭✭✭✭ EXCEPTIONALLY SAFE – Do not waste your money on all those cheaply made torches that break and stop working after a while. Featuring anti-flare technology, Spicy Dew torch comes with CHILD SAFETY LOCK for accident and worry-free use. 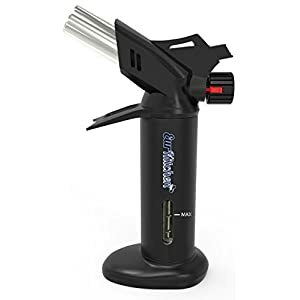 Unlike many other cheap torches, our well-constructed torch is made of heavy duty metal with a sturdy fixed BASE to stop it falling over when you set it down, FLAME GUARD to prevent flaring and HAND PROTECTION GUARD to protect you from the heat of the flame. ✭✭✭✭✭ EXTREMELY EASY TO USE – You deserve to feel confident and be the boss of flame production. 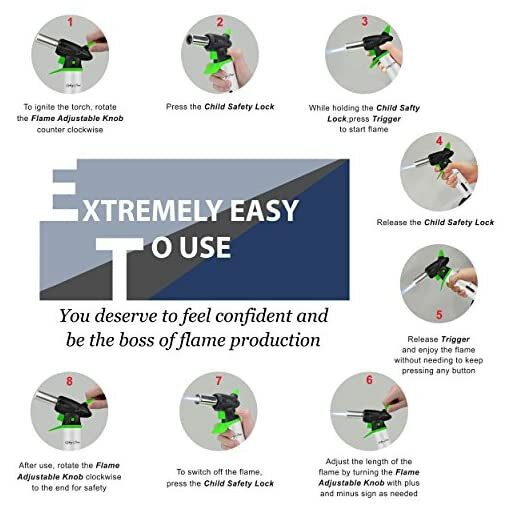 Starting the flame is as easy as pressing the CHILD SAFETY LOCK and the TRIGGER button after rotating the FLAME ADJUSTABLE KNOB counter clockwise. Depending on what you’re using the torch for, you can easily adjust the intensity of the flame. 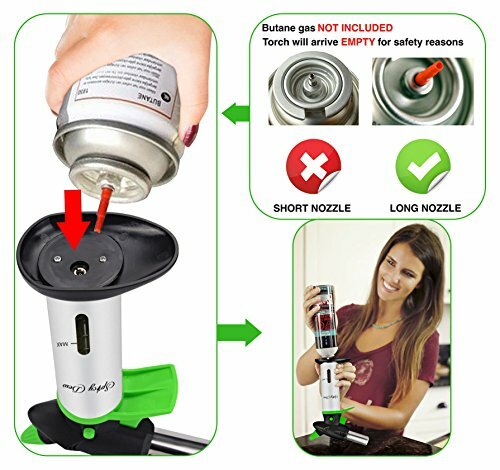 It is very easy to refill the torch using widely available BUTANE GAS (NOT INCLUDED). 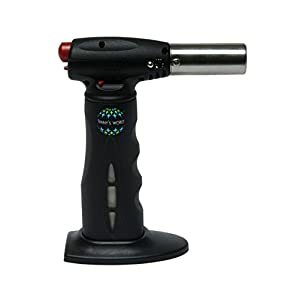 This compact Torch has a FUEL GAUGE WINDOW for refill indication.